Pregnant, yet deep within I knew I couldn’t give this baby life. The decision was made to abort and back then, over 30 years ago, I was unaware of how this experience would influence my spiritual development. Now in my 60’s I can see how it contributed to the meaning and purpose of my life, an experience that helped me develop compassion for myself and others, and offer a timid act of resistance to the relentless patriarchy of my religious tradition. Circumstances meant I flew to Sydney for the abortion. Should have been straightforward but mistakes were made and my life was in jeopardy because of an unidentified bleed. A Kiwi nurse held my hand as I was packed full of dressings and hooked up to a continuous blood supply. The next day she went with me to theatre where the internal damage was found and repaired, just in time. How much her connectedness with me mattered. I remember the way she looked deep into my soul during those days of despair. It was as though God took on female form with compassion, acceptance and love writ large on a nurse’s face and in her ritual, nurturing actions. All done within sight and sound of the patient who told her visitors in self-righteous tones, loud enough for me to hear, about ‘the abortion over there gone wrong’. Soon I was back home in a New Zealand church attending a baby’s funeral. I cried incessantly, deep wracking sobs. Couldn’t stop and didn’t want to even though I was piggybacking on someone else’s grief and funeral rites. Where was the rite for the remains of the child I had aborted and for the sustenance of my soul? Who decided what was sacramental, or not? 20 years on whilst training to be an Anglican priest, I found myself reliving significant life experiences, including the abortion, and beginning to write Godde instead of God. It was code for the feminine aspect of God, the tiniest act of resistance to the avalanche of male-dominated thought about what we might mean by God. Thank Godde for feminist theologians who fuelled my growing discontent. My life experience as a woman, a priest and now working to integrate spiritual care in a district health board shows me that the stories we live by matter. Furthermore, the stories of that which we hold as sacred, the inspiration to live within the existential nothingness of the void, are mighty stories that carry unspoken layers about who we are and what we might become. They work best within rituals that ground us in the uncertainty of life and offer inspiration, especially in dark times. Imagine what it might be like if there were more Godde stories to help us do this. I suspect a form of religious fundamentalism drives abortion protesters and stops New Zealand politicians from addressing our outdated abortion laws. Unfortunately, as Marist priest and social anthropologist Dr Gerald Arbuckle says in his book Fundamentalism at Home and Abroad, fundamentalism is an emotional reaction to the disorienting experience of change and fundamentalists are not open to rational discussion. This skews conversation. Conversations about how we understand life, its beginnings, endings and the messy bits in between are an evolving journey for all communities. Our abortions matter in these conversations because they are so foundational in the mighty stories of our lives. They are excruciating moments that deserve the grounding of creative and compassionate rituals, not the destructive gauntlet of fundamentalist protest. 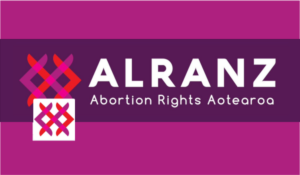 The image in this blog is the logo for ALRANZ, Abortion Law Reform Association of New Zealand, a group campaigning to make abortion legal and safe for women in New Zealand. I wholeheartedly support their efforts.